This Friday we celebrated Midsummer Eve in Sweden. So I thought I'd share some pics and info about what we traditionally eat and drink at Midsummer Eve. 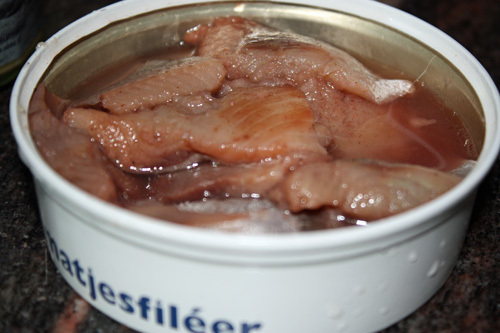 Matjessill - Matie Herring is a given at the table and the most common type of pickled herring to eat at Midsummer Eve in Sweden. Although I prefer to eat "normal" pickled herring, the ones in jars. 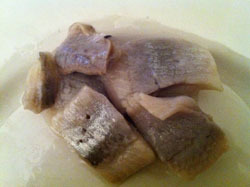 The difference between pickled Matie herring and "normal" pickled herring is that Matie herring is caught in early autumn just before the herring becomes mature to mate. This is when the fish has the right fat content, size and has eaten the type of food which gives it its special Matie herring flavour. To wash down the pickled herring we drink snaps - shots. 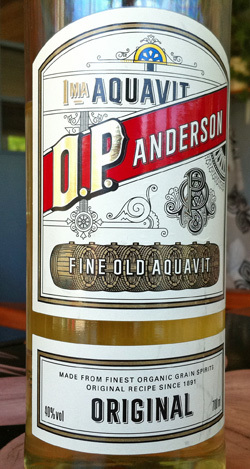 Preferably OP Anderson Aquavit. And you are supposed to sing snapsvisor - special booze songs before you drink each snaps, but I just drink. Lol! 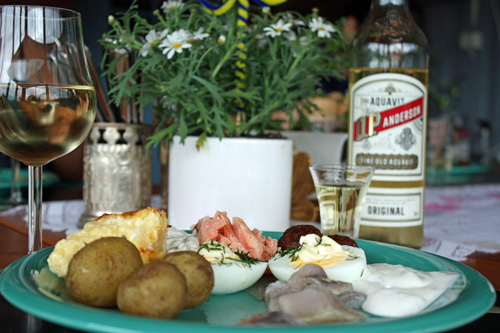 My Midsummer plate and drinks. 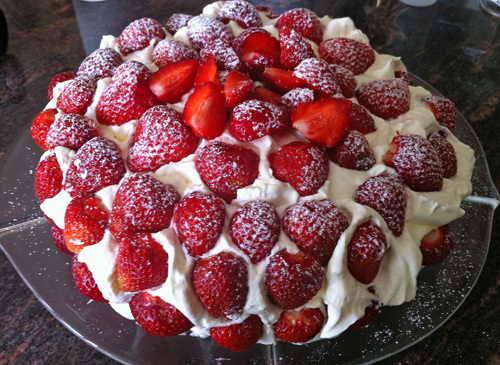 Finally, my favourite part, a Midsummer Eve MUST and classic dessert - Strawberry cake with Swedish strawberries! And this the piece I bought. Not a whole cake, but a smaller version of a Princess Cake. Which is just as yuuummy!!! - The first princess cake recipe was published in "Prinsessornas kokbok" (The Princesses cookbook), written by household teacher Jenny Åkerström in the 1930s. - In her cookbook Jenny first referred to this cake as "Green cake". The name eventually changed into Princess Cake because her students, the princesses Martha, Margaret and Astrid (daughters of Prince Carl and Princess Ingeborg) was said to have been especially fond of this cake. - A classic Princess Cake is made of sponge cake, whipped cream, custard, mixture of whipped cream and custard, and covered with green marzipan. It's usually decorated with a thin layer of icing sugar on top and a red marzipan rose or something similar. - Even though most Princess Cake recipes today contain jam, it was not included in the original recipe. 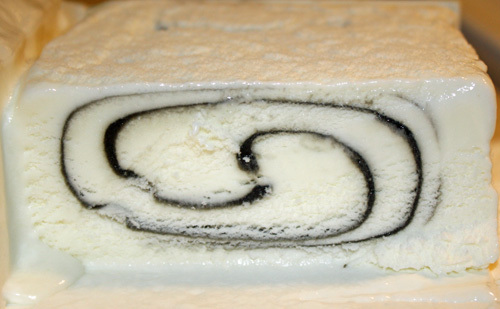 A classic Princess Cake should also have whipped cream (not sponge cake) immediately below the marzipan layer. 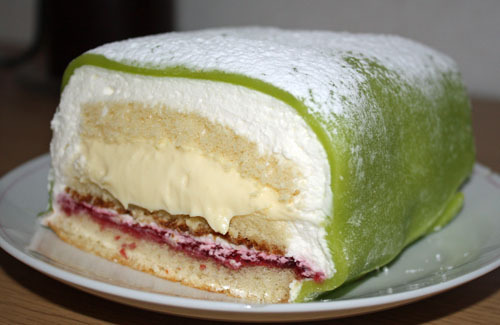 - Each year approximately 500 000 Princess Cakes are sold in Sweden. My sister turned 25 today, Happy Birthday sis! As usual, in exchange for gifts - there must be cake!!! Hehe. And cakes there were! 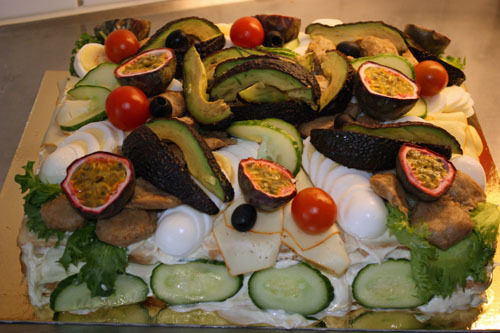 First we had a veggie sandwich layer cake (smörgåstårta) which I was a bit skeptical towards. Mainly because I had never eaten a veggie version of this type of cake before. But I must say that it was insanely delicious! Even the "meat" pieces on it were tasty. So a huge YUM for that one! 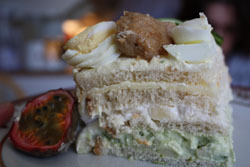 The veggie sandwich layer cake. 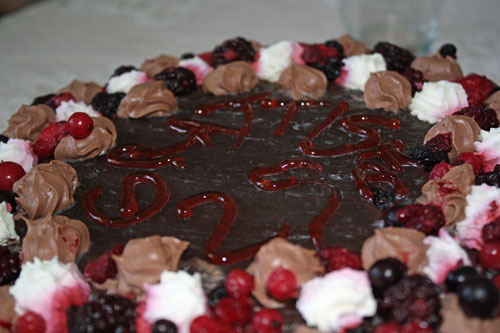 Second cake was a home made chocolate cake. Also spectacular, but very heavy in consistency. Therefore I could only eat a small piece of it. However, I'm sure the large piece of sandwich layer cake I had before the chocolate cake could have played a some part in me not being able to eat as much as I would have liked to of it. 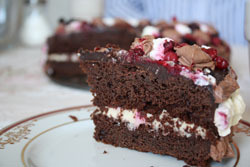 Therefore this chocolate cake definitely also deserves a huge YUM! The home made chocolate cake. I have finished 8 pages about typical Swedish food we eat in Sweden, plus an intro page --> Swedish food, where you can see which Swedish food I have written about. I have added this section under "About Sweden" in the menu. On each Swedish food page I have included some history about why we eat this in Sweden and how I like to eat it. On a few pages I have also shared some Swedish food recipes. Before I introduce these pages I want to thank all of you who helped me with suggestions on which Swedish food I should write about. Luke you mentioned that "the British love the root vegetable called the Swede". I had never heard that expression before, so I looked it up. When I realized what it was, I can't say that I have ever cooked it. I don't even remember if I have ever eaten it, hehe. This vegetable is also called "The rutabaga" or in Swedish kålrot - cabbage root (literal translation). You can read more about it here. 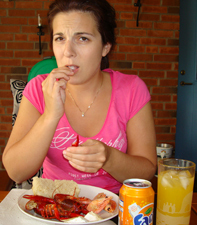 Typical Swedish Food - any suggestions? 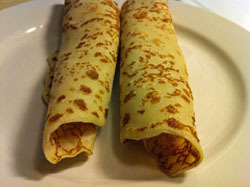 At the moment I'm working on adding pages about Typical Swedish Food in my About Sweden category. I will create an individual page for each Typical Swedish Food where I write a bit about why we eat this in Sweden. 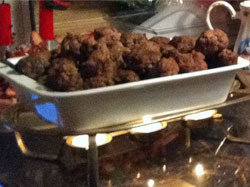 I will also include some history and common ways we/I prepare and eat this Typical Swedish Food. A few of my Typical Swedish Food choices include (starting from the top left pic); Falun sausage - Falukorv, Smoked pork sausage - Isterband, Pickled herring - Inlagd sill and Potato-dumplings - Kroppkakor. Left pic: First I picked up my sister and Diva. Right pic: Here they come :-) And off we went to mum. Left pic: Rice pudding for lunch. One of our traditions is to hide an almond in the rice pudding and whomever gets it win a lottery ticket. 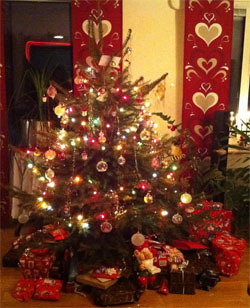 But I didn't get it this year :-( Mum did.Middle pic: Here we, me and relatives, are playing cards and drinking glögg-martini. Right pic: At 3 PM time for - Donald Duck "From All of Us to All of You". 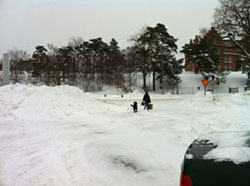 A deeply rooted Swedish tradition, lol! It's true, the cartoon first aired in Sweden 1960, and has ever since been one of the most watched TV-shows every year in Sweden. Last year, 2009, it was number three on the list over "the most watched TV-shows in Sweden" with 3 294 000 viewers. Hehe. Left pic: After Donald, time for food preparations. 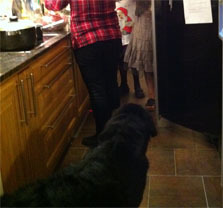 It is always busy in the kitchen on this day. Right pic: Lisen hoping someone will drop something without knowing it, so she can sneak up and grab it. Yay! Food time! 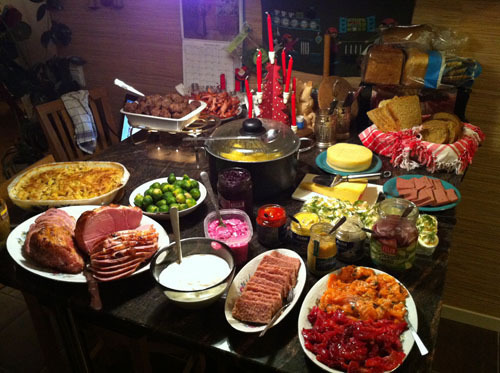 Here is our julbord! On it is for example; Christmas ham, meatballs, pickled herring in different sauces, brawn, chipolata sausages, ribs and my favourite, Janssons frestelse - Janssons temptation. 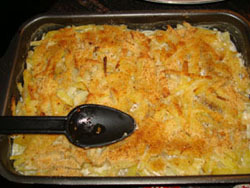 Janssons consist of potato casserole with onion, pickled anchovies, bread crumbs and cream. Sooo good! Left pic: We start of our main meal with a snaps of Absolut vodka. Cheers!!! Middle pic: This is my first plate of food. Right pic: And here is my second, hehe. Lisen wondering when she can have some. 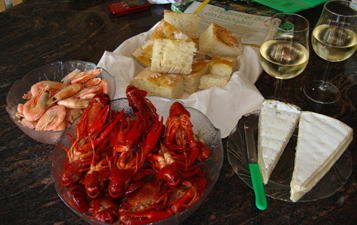 Left pic: Between meals this is what we snacked on, Christmas candy, yum! 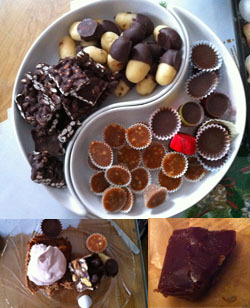 My aunt makes the best homemade fudge ever (below right)!!! 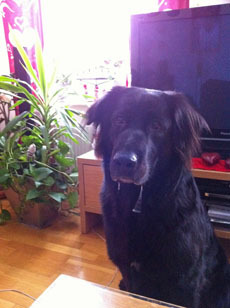 Right pic: Diva want some too!!! 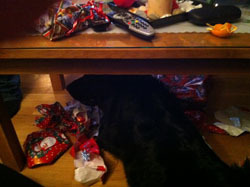 Left pic: Finally time to unwrap all these gifts. 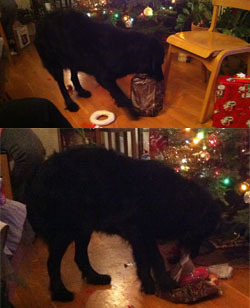 Right pic: Lisen loooves getting and opening gifts, lol! I like getting gifts too, and I got some, ehum, unexpected gifts this year. Like a tool box, which I thought was very unnecessary at first, but then when I got home I realized that it's probably better to have all tools, screws and such in one place. So it was a good gift after all. I also got a mini snow shovel for my car, unexpected but greatly needed now for sure, a calendar, face mask and some other stuff. But as always, my favourite gift to get is MONEY! Which I got this year, yay! 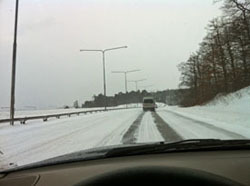 And tomorrow I'm off to Kalmar to spend it all at this years big Christmas sale, yihaaa!!! After we had ripped open our gifts we ate (forced down) some cake and then just chatted and played some games. In these pics Lisen and Diva looks pretty much how I felt after this day, stuffed and tired. Hehe. 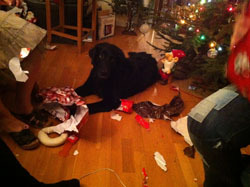 But it was a lot of fun and I had a wonderful Christmas Eve, as I'm sure they did as well. 1. Cut two potatoes into squares, boil for 10 minutes. 2. 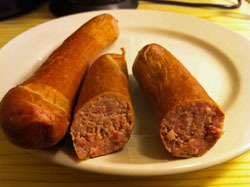 Cut sausage and onions into squares, put in frying pan and fry. 3. When the sausage and onions are almost ready, throw in the boiled potatoes and stir. 4. When everything is ready, move over to a plate. 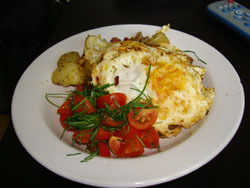 Quickly fry two eggs in the same frying pan and make sure the egg yolk is loose when served. 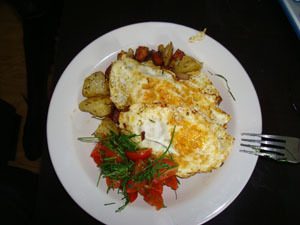 Based on the Swedish classic - Pytt i panna, or in English - Swedish hash. I'm working hard on my Swedish pages, they will probably take a few more days. But I thought I'd give you a little preview of what's to come. So here are a few Swedish classics when it comes to food, with my personal touch of course. Meaning, this is how I eat it. Above: This is called "falukorv" in Swedish, and it is a big sausage you could say. You usually slice and fry it in a frying pan, but it can be boiled whole as well (however I have never eaten it that way). I usually eat "falukorv" with milk stewed macaronis once a week. Sooo good!!! 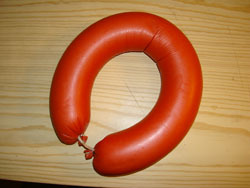 Above: This is called "kroppkakor" in Swedish. 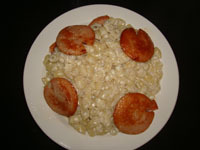 It is a local dish made and eaten mainly here in south Sweden. 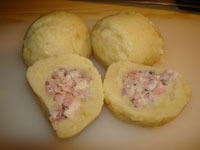 Main ingredients are boiled potatoes, later pressed and mixed with flour and egg to form a ball. 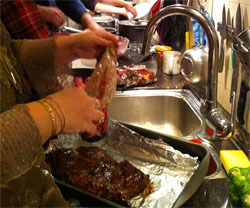 Inside is pork, seasoned with salt and crushed allspice, which have been fried in a frying pan. 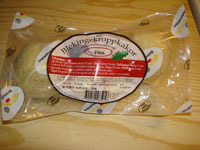 There are two main versions of this dish, either grey or white "kroppkaka". 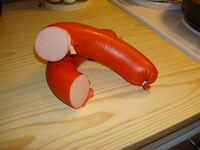 You usually boil the grey one in water and eat it with melted butter and lingonberry. Whereas you usually fry the white one in a frying pan and eat it with a white sauce and lingonberry. I prefer the latter and it is the one featured in the photos. I also ordered an Iphone 4 today, however there is a couple weeks waiting period because of the high demand right now. Oh well, hopefully I'll get it before Apples Iphone 5 gets out...haha.